Hip-hop legend Shawn "Jay-Z" Carter described President Donald Trump's "shithole countries" comment as disappointing and hurtful. "Everyone feels anger, but after the anger it's really hurtful because he's looking down on a whole population of people and he's so misinformed because these places have beautiful people," he told Van Jones on the debut of his CNN program, "The Van Jones Show," which aired Saturday on CNN. Trump made those comments in an Oval Office meeting, according to some of the participants, as he rejected a bipartisan immigration deal to protect DACA participants. "Why do we want all these people from shithole countries coming here?" he reportedly told senators on January 11. Jay-Z said Trump's comments expose a larger problem of racism in this country and the way that people still talk behind closed doors. "There was a moment when Donald Sterling had been exposed as this racist on a private phone conversation that he was having and they took his team from him," Jay-Z said, referring to remarks made in 2014 by the former owner of the Los Angeles Clippers. "And it's like, OK, that's one way to do it. But another way would have been, let him have his team and then let's talk about it together. ... Maybe some penalties. Because once you do that, all the other closet racists just run back in the hole. You haven't fixed anything. What you've done was spray perfume on a trash can," he said. Continuing the analogy, he explained that more spray attracts more bugs as you're not actually dealing with the trash -- in this case, racism. "You don't take the trash out. You keep spraying whatever over it to make it acceptable and then, you know, as those things grow, then you create a superbug. And then now we have Donald Trump, the superbug," he said. Asked by Van Jones whether it's OK for Trump "to say terrible things but put money in our pockets" amid Trump's claims that unemployment for African-Americans has dropped, Jay-Z said no, "because it's not about money at the end of the day. Money doesn't equate to happiness. It doesn't. That's missing the whole point. The hip-hop star explained that many African-Americans and people in middle America have reflexively voted Democrat for years because their families did, but their needs weren't addressed. "My problem with government is, I think they forget that it's real people behind these decisions that they're making. ... We're, like, people going through real things in real time and in real pain. And when you ignore that pain for so long, people -- they will act out, and it's like, 'I want to see something different." And that opens the door to what we're living through now." He added, "Now, politics has become about votes and not about people." Jay-Z was a frequent visitor at the Obama White House but told Van Jones that he doesn't think he'll get invited while Trump is in office. Jones joked that Trump may surprise him, making a play to be the first "hip-hop president" because he would "get in beefs with people," likes bling and has a plane. 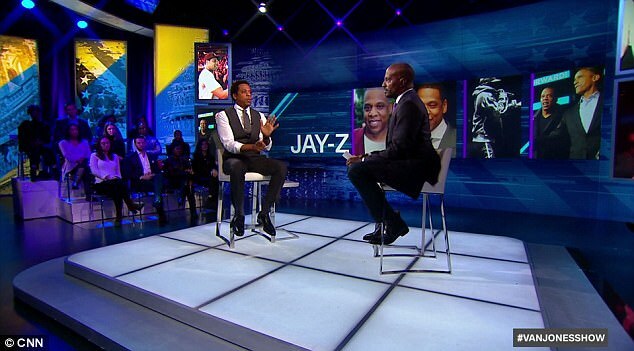 "Yeah, well, he doesn't have the struggle," Jay-Z responded.